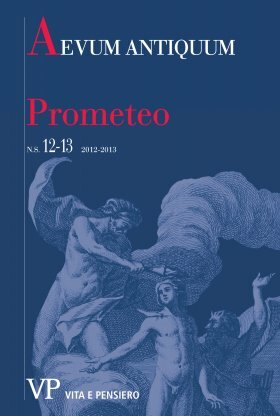 The paper focuses on Prometheus’ iconography, that had great spread in European art from the 1860’s and the first decades of the 20th century. The topic has been so far poorly deepened in a specific manner. After Baroque, that used to emphasize on gruesome and macabre aspects of Prometheus’ myth, the figure of the Titan partially went back to the top during Romanticism; but it is mainly in the Symbolist age that the myth was taken up with increasing frequency and intensity by the artists, often in the framework of its esoteric-theosophical (sometimes gnostic) interpretation. From this point of view, the figure of Prometheus assumes evident allegorical meanings, as emblem of man’s liberation from the restrictions of his condition: stealing fire from the gods becomes the paradigm for spiritual elevation, that is the aspiration to unburden from constraints and subordination to ascend towards Knowledge; hence Prometheus as a ‘great initiate’ (referring to the title of a famous book by Edouard Schuré). Moreover, this instrumental reference to mythology (not only Greek-Roman) is one of the most typical features of symbolist art, that loved charming and sometimes disturbing characters of ancient sagas, conferring them semantic and metaphorical values that transcended the traditional ones. The examined works are different and representative and they do not mean to retrace a complete repertoire: they range from well-known artists such as Gustave Moreau and Arnold Böcklin to Jean Delville and František Kupka, until the Italian Carlo Fontana and Filippo Figari.